Sometimes also referred to as curcumin (a constituent of turmeric), Indian Saffron, and Alappuzha. 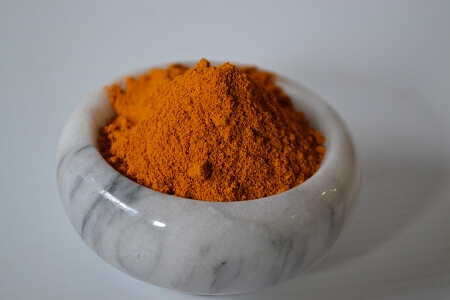 We offer a powdered Alleppey turmeric, which is obtained from the rhizome (underground stem) of the plant. It is a deep orange-yellow color with an earthy, bitter, peppery flavor and a mustardy smell. Alleppey turmeric is reputed to have a higher curcumin content, which gives it a little darker color and more oiliness than other turmerics. The high oil content of turmeric may warp or melt some plastic spice jars. Our PETE spice jars, however, do not warp or melt.